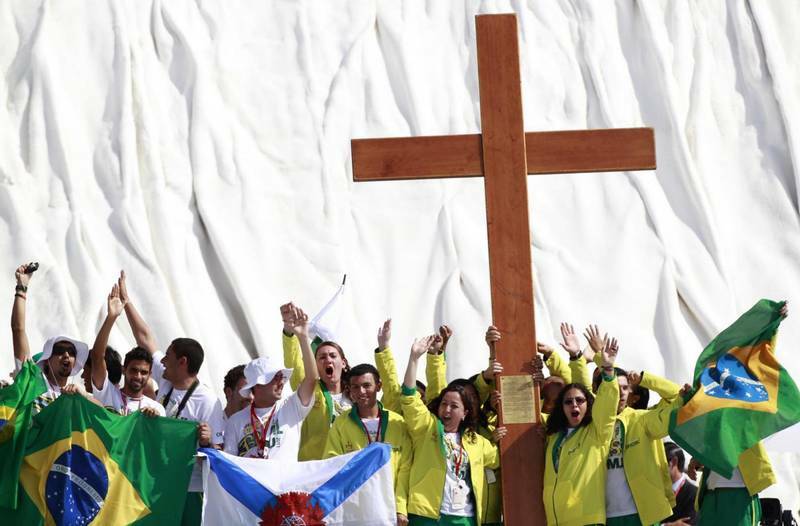 Rio de Janeiro has been confirmed to host the next World Youth Day and pride and boldness of Brazilian church is immediately increased. But the data coming from the “New Map of Religions” published by “Foundation Getulio Vargas” and released in a note by the Misna agency, reveals that for the first time the percentage of Catholics in Brazil in 2009 was the lowest recorded in 140 years of statistical research, falling below the threshold of 70%. Between 2003 and 2009, Catholics have dropped from 73.7 to 68.4%, today they are 130 million. Just among boys between 10 and 19 years of age, the index dropped the most, going from 74.1 to 67.4%. Rio is the region with the lowest number of Catholics (49%) followed by Roraima (46%). The study also documents that the Evangelicals, little less the Pentecostals (such as the Universal Church of the Kingdom of God), besides the traditional ones, have increased, in the same period of time, passing from 16.2 to 20.2%; also increasing the “without religion” (from 5.1 to 6.7%), while the so-called “alternative religions” have gone from 3.2 to 4.6%. "The changes that before occurred in over 100 years, now take place in 10 years. If this decrease of 1% per annum is maintained, the Catholic population will be less than half in 20 years" said Marcelo Neri, head of research.